A striking cover featuring The Forbidden Garden, and composed of two panels of Laika experiencing both danger and hope in the Forbidden Zone. The wild animals in the Forbidden Zone threaten Laika’s life every time she ventures there now, but the discovery of a water source means she can now water her plants freely and has taken the first step of freedom away from Gladvis’s blackmail. All the while she has to dodge the police because it is illegal for her to be in the Forbidden Zone, and their patrols are getting more frequent now. In “Alice in a Strange Land”, Alice has briefly succumbed to brainwashing and cannot remember who she is. She soon regains control, but is now threatened with drowning. More brainwashing victims are freed in Children of Edenford after Patti turns on the sprinklers because tears seem to be the antidote to the brainwashing. But then they go the other way with rioting, and are then back under Miss Goodfellow’s control – in spades. In The Four-Footed Friends it’s Riley’s birthday, but there is no let-up from Mrs Marshall and her bizarre ideas about cleanliness and keeping Winston and Riley apart for snobby reasons. They defy her once more by striking out together. But how long will it last? Another party gets ruined in “I’ll Make Up for Mary”. The youth club manager organiser arranges a party. But bad Beryl and her toughs wreck everything and poor Ann gets blamed by her parents. Plot: Mankind has polluted the atmosphere, causing plants to become extinct and soils incapable of growing any. The plants that do survive are protected in laboratories while public places are filled with plastic substitutes. The pollution and lack of plants also means water and food are strictly rationed, and punishments for transgressors are harsh, such as imprisonment for water stealing. Other harsh measures are taken as well, such as imprisonment for breaking curfew and destroying pets because they are a strain on food supplies. People start dumping them in the Forbidden Zone (a ruined part of old London) instead. Laika Severn’s sister Valli is extremely ill, but her parents cannot afford hospital care, which is for rich people only. Valli wishes to see a real flower, but where to get one? Then, one day Laika trespasses into the Forbidden Zone. To her astonishment, she finds a patch of earth with grass growing in it. As she explores further, she discovers evidence that the patch once belonged to a gardener. She finds seed packets and immediately sees her chance to grow a flower for Valli. But the seeds need water, and that poses a problem in this water-rationed society. Eventually Laika is driven to the imprisonable offence of stealing water from school. Her transgression is photographed by “the meanest prefect in the school”, Gladvis Clampp. But instead of reporting Laika, Gladvis starts blackmailing her into doing dirty, exhausting work at her Uncle Maxwell’s food processing factory in the industrial zone, in exchange for more water. He is only too pleased to have cheap labour that he can pay just with water and does not care that it is illegal because Laika is underage. And in return, he gives Gladvis off-ration food. Nonetheless, the seeds start sprouting, and they start with the tears Laika sheds. Then Laika finds a water source in an old washroom because the authorities forgot to turn off the pipes. Now Laika has no need for her water wages from Gladvis’ uncle, but she is still being blackmailed. Then, when Gladvis orders Laika to clean up to her room, Laika manages to break into Gladvis’s safe for the blackmail evidence. She discovers she is in good company – the safe is full of evidence that Gladvis has been using to blackmail people. Laika destroys everything to free her fellow victims as well as herself. Her act also sets off sprinkler systems and sends Gladvis running! Later that evening, Laika finds that her plants seem to be growing at an unusually fast rate that seems abnormal for plant life. Another problem are the animals that have been dumped in the zone – they have grown ferocious and dangerous, and could kill people. The authorities are taking drastic measures to cull them. Laika knows Gladvis will take revenge, but she does not anticipate how far Gladvis goes. Gladvis contrives to have her father (Mr Severn’s manager) demote Mr Severn to “C” Worker, which forces the family to relocate to the dreaded industrial zone. However, before she leaves for the industrial zone, Laika tells her friend Kara Stayn about Gladvis and urges her to pass the word around. In earshot is Miss Karvell, a teacher with a reputation for favouring Gladvis. The industrial zone is a depressing, dreadful place to live in. It is so seriously polluted that people have to live in “horrid” shabby flats located underground. School is a dump with no lessons at all and filled with rough kids who are pale from never seeing the sun. Mr Severn is even more depressed at his new job because Grade C workers get “all the awful jobs” (something Laika herself experienced during her brief stint at the food processing plant in the industrial zone). And there is no way out of the industrial zone; once you are there, you are there for life. Not surprisingly, Mrs Severn is overwhelmed with depression and despair. Only Valli remains cheerful and hopeful because Laika promised her a flower. But Laika cannot even wangle a pass to get to her plants. Then, Laika is surprised when the Child Protection Force arrives. They take her away and put her in with Kara’s family. They have received information that she is brilliant; brilliant children are placed in the care of the force and given privileges. This means a forced, heart-breaking separation from her family. On the other hand, it also means a return to her old school, a chance to bone up on horticulture in the library for the sake of her plants, and to see them again. When she does, she finds they are growing at a phenomenal rate and wonders if there is something odd about them. She is also puzzled as to how she got into the protection of the force; she is intelligent but not brilliant. She begins to wonder if she has a secret friend. The rainfall (programmed so water can be collected) is advanced, and Laika goes into the Forbidden Zone as she fears her plants will be damaged. But Kara follows and suffers a head injury in a flooded underground passage, while Laika lets it slip about her garden. When they get out, they are caught by the police for curfew-breaking (also an imprisonable offence). But Miss Karvell comes and, to Laika’s surprise, gets them off the hook. However, Kara’s parents are furious with Laika over what happened. Next day, Laika finds out that Miss Karvell is her secret friend. It turns out that Miss Karvell and other staff members were among the victims that Laika freed from Gladvis (but Gladvis looks like she is still in business and finding new victims to blackmail). In return, Miss Karvell falsified Laika’s school records to get her out of the industrial zone and into the Child Protection Force. She asks Laika to confide in her as she suspects a problem; Laika asks to keep things secret a little longer. Miss Karvell also says that Valli has worsened and nearing death. This prompts Laika to go to her garden to see if her plants have bloomed in time for Valli. They have, but they are hideous mutants. Shocked, Laika smashes them, then tears up the seed packets and throws the seed around in a fit of pique. She heads back to Kara’s, where another shock awaits. In a state of delirium, Kara rambles about “Laika’s garden”. Fearing the police will soon arrest her for trespass in the Forbidden Zone, Laika heads back to it, collecting food rations on the way. But the rats eat her rations and the wild animals force her to barricade herself into the washroom. Hunger drives her out in search of more rations, but she gets lost in dense fog. Meanwhile, the police force things out of the weakened Kara and head to the zone to look for Laika. Back in the Forbidden Zone, Laika suddenly smells a heady perfume. It is so powerful she can follow it, even in the fog. It leads straight back to her garden. Laika is astonished to find her garden is now suddenly a tropical paradise! Laika realises the plants must have grown from the seed she threw about when she had her tantrum, but cannot understand why they have grown so fast or huge. Then she discovers an old notebook left by the gardener. He was conducting experiments to reverse the environmental damage to his garden. At the time his efforts failed, but now they are paying off. However, the garden is producing mutant flowers, hence the abnormalities Laika has noticed. Laika then gets a most daring idea – trade the notebook with the scientific community in exchange for the best hospital care for her sister. She enlists the help of Miss Karvell for this, while running the gauntlet with the police and turning the heads of the townsfolk with armfuls of real flowers in the process. Laika’s plan works and help arrives in the nick of time for the dying Valli. By the time Valli has recovered enough, her flower is waiting for her. And there is a butterfly to go with it. Nobody has seen a butterfly for ages, and they take it for a sign that Earth’s ecology will be restored. Jinty was known for her environmental stories, and The Forbidden Garden is another of her most endearing classics on this theme. Its message of what we can do to our environment through pollution and other careless acts seems even more real now in an era of increasing mass extinctions and even bees under threat. Even if we survive, the society we could create for ourselves may be even grimmer than the one depicted in the story, which was grim enough. The drive to preserve the existing food and water has produced harsh measures, which can be seen in every inch of society, and not just in laws governing water-stealing and killing pets because they are a drain on food supplies. And the Forbidden Zone, which gives Laika indications of how life used to be, contrasts so wistfully with the life she has to lead because there are no plants. For example, Laika sees old advertisements for sweets and vegetable seeds, and reflects ruefully on how she cannot have either; sweets are banned and nobody can grow fresh vegetables except in laboratories. We also see the bleakness in the uncle’s food processing factory, where work is done by hand because machines are a drain on the country’s dwindling power supply. The monotonous, repetitive, boring work makes the factory a grim place to work in; “the workers look like robots” and “bored stiff”. The work Laika is forced to do is even worse – the gruelling job of cleaning out vats with cleaning chemicals that choke her. It exemplifies what is meant by the “awful jobs” that the Grade C workers are lumbered with in the industrial zone, and what Mr Severn must go through at work when he is demoted to C Grade. And the uncle makes it even grimmer for the factory because he is a mean man who is capable of underhand tactics such as exploiting underage workers and giving his niece off-ration food in exchange for providing him with Laika’s cheap labour. It would not be surprising if he and Gladvis make a regular habit out of exploiting her blackmail victims in this way. The caste system that Laika seems to live under makes it even grimmer. From what we gather, the worker system is graded A, B and C. A is the top, where the Clampp family is, B is the middle, where Laika’s family are, and C is the very bottom, where the worst jobs are reserved for people, and no way out of the depressing, polluted and clearly underfunded and uncared-for industrial zone. And the pollution of the industrial zone, which forces its people to live in dilapidated underground flats, shows just how many lessons have been learned about the dangers of pollution after the mass plant extinction it has caused. Even brilliance (presumably driven by a desperate need to preserve the best) causes more oppression, with authorities granting special privileges to brilliant children, but also forcing their removal from their families and into the protection of the child protection force. And money, as always, defines the class distinctions even further; hospital care, for example, is for the rich only. Nobody seems to speak out against the severity of this society, nor do we see what happens to anyone who does. Demotion to the industrial zone seems a punishment in itself, and its use against the Severns indicates that it can be used – and abused – to get rid of people. It would not be surprising if the industrial zone is used in this manner regularly. The heroine herself is not quite a rebel against the system either. Unlike Cassy Shaw of Land of No Tears, who rebels outright to change the oppressive Alpha-Gamma system, Laika is no crusader who wants to change the inequities and harsh measures of her society. Sure, she hates the destruction of the planet’s ecology, defies the law to break into the Forbidden Zone and in obtaining water, and fumes at how her sister is dying because they cannot afford hospital care. But the liberties she takes are driven by her love for her sister, and to fulfil her sister’s dying wish to have a real flower. Nonetheless she too ends up changing her society – not through rebellion and overthrowing the system, but by taking the first step to reverse the ecological damage that led to its creation. Some things do stretch a point. It is never explained how mankind actually survived the extinction of the plants or the atmospheric pollution, or how they manage to survive without plants – except in a very oppressive manner. For that matter, it is not explained how Earth itself manages to keep going without plants. And even if the flowers in Laika’s garden are mutants, it is stretching credibility that they can start growing from Laika’s tears or grow so fast and huge after a deluge of water. They could have not had more than a week to do so. Still, this story stands the test of time, and the issues it explored then are perhaps even more relevant today. It is a well-written story, filled with drama, emotion, and hope and love against desperate odds, a race against time, and an oppressive system. 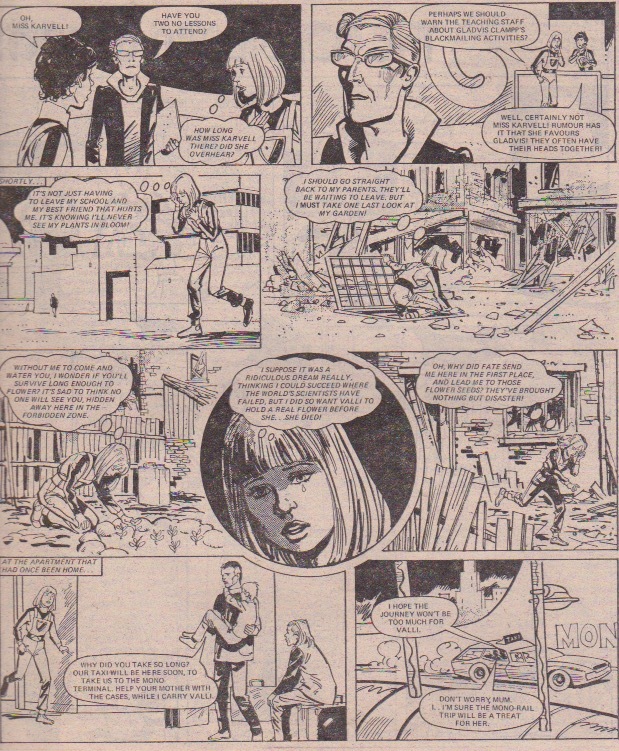 And the artwork of Jim Baikie lends itself brilliantly to the depiction of this harsh society with his cross hatching and powerful line work. A stalwart of science fiction stories in 2000AD, Baikie was right at home here with The Forbidden Garden. It is small wonder that The Forbidden Garden was one of Jinty’s most popular and best-remembered stories. 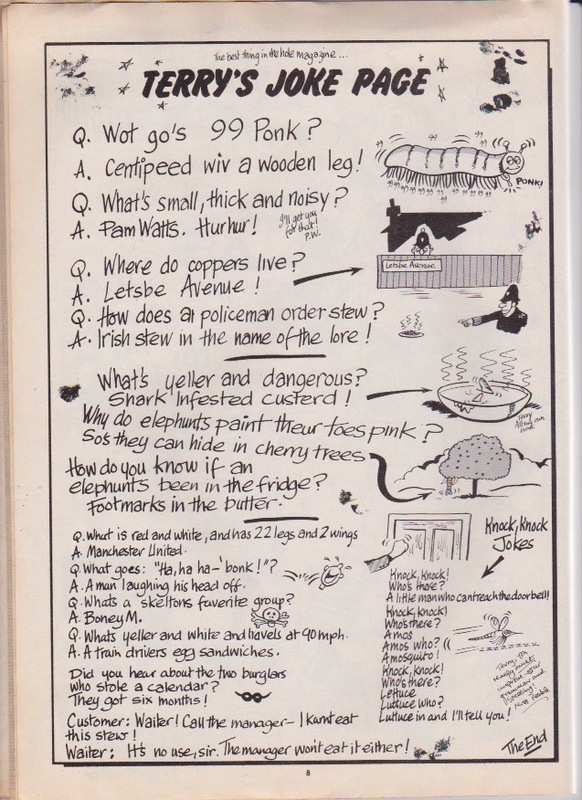 It is a real shame that its reprint in Tammy (possibly prompted by Pam’s Poll in 1980) was cut off so abruptly by Tammy’s sudden disappearance. Many apologies for the long break in between posts. Life has got hectic and the run-up to Christmas didn’t help! Stories featuring sports are very prevalent across the range of girls’ comics titles. This clearly taps into both the day-to-day experiences of many or most schoolgirls (playing on their hockey or netball teams) and into aspirational ideals (winning regional or national contests, going on to have a career in their chosen sport, excelling at unusual sports). At one end of this theme, many many stories will have some element of sports included, simply as a part of the protagonist’s daily life; I don’t count these as “sports stories” per se. At the other end of the spectrum, there are stories that are clearly mostly about the pursuit of excellence in the protagonist’s chosen sport, with a sprinkling of some complicating factor to spice the story up, such as peer rivalry. And in between there are stories where the sports element are strongly included but given a reasonably equal weighting with other elements. To me, therefore, a “sports story” needs to feature the sport in question as the main story element, or with equal weight with the other elements. Often the story positively teaches us various details of that sport in a didactic way, as if part of the expectation is that readers might have their interest sparked by that story and go on to take it up themselves. The protagonist is someone who takes seriously the idea of practice, learning, improvement in their chosen area: they are not just naturally gifted without trying at all, and part of the drive of the story is about their drive to improve or to excel. It seems obvious, but it also needs to be a sport not an art: as you would expect, there are plenty of ballet stories, and these are excluded from my categorisation. Ballet has its rivalries but it is not a competition with winners and losers, except in artificial ways that the writer might set up (for instance in “The Kat and Mouse Game”, the ‘winner’ gains a contract with an influential ballet impresario). Finally, it is worth remembering Jinty also had a strong focus on sports in ways that lay outside of the stories themselves: for a period of time there was a specific sports section in the comic, with articles about specific sports, improvement hints and tips (such as how to win at a bully-off in hockey), and interviews with sports women and men. Over and above this, there was a lengthy period where Mario Capaldi drew cover images illustrating a very wide range of sports – netball and rounders, yes, but also archery, bob-sledding, ski-jumping… These are not sports stories, but form part of the context in which the sports-themed stories need to be read. There are so many strong sports stories that it is hard to choose a single one as a core example. A wide range of sports are represented: ones that a schoolgirl might well have direct experience of such as hockey, gymnastics, running; and more unusual ones like judo, water-skiing, and figure skating. 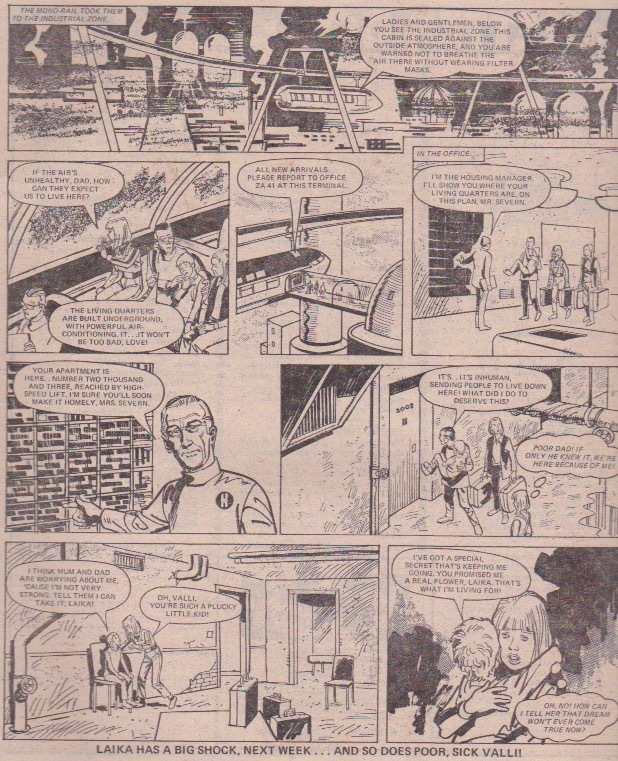 “White Water” (1979-80), drawn by Jim Baikie and included in the sports section that Jinty ran for a year or so from late 1979, is a classic example of a story that includes teachable elements as well as dramatic ones. Bridie is in a sailing accident with her father, who is killed: her grieving mother moves them away from the sea and into an industrial city that depresses Bridie mightily. As well as grieving for her father, she also has a gammy leg that was badly hurt in the accident, so Bridie is pretty fed up; but she then finds out about a local canoe club. She is determined to learn canoeing, especially once she is told about sea or white-water canoeing. Along the way there are rivalries and misunderstandings – her mother hates the idea of Bridie doing anything at all like sailing, and the existing star of the canoe club doesn’t like the challenge represented by this bright (and sometimes tetchy) new member. But the story includes lots of information about canoeing techniques, certainly enough to either help interest a reader in the sport, or even to help someone already learning it. You can see below the wide range of sports represented in Jinty. Battle of the Wills (1977) – gymnastics and ballet. As ever, there are clearly-related stories that don’t quite fit in the main theme. 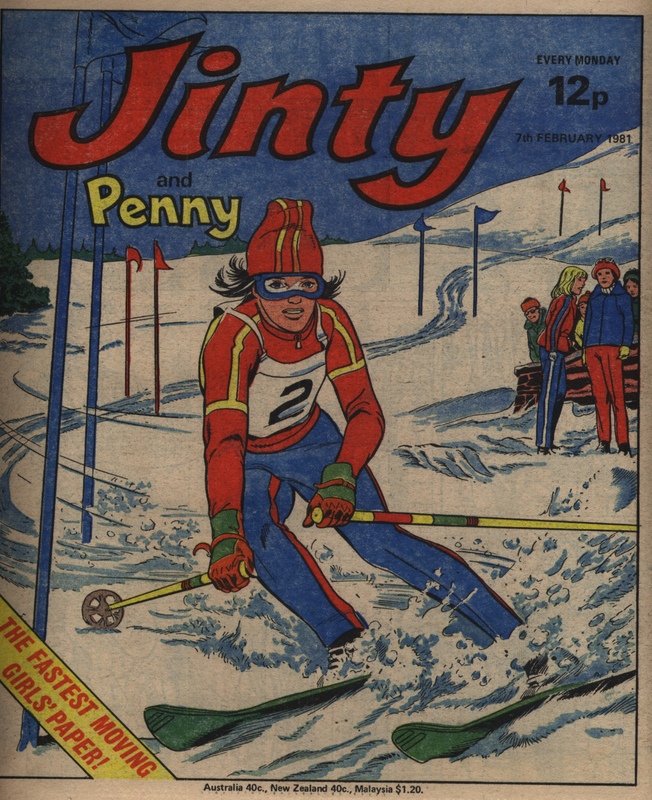 Sports are such a pervasive trope in the life of Jinty and other girls’ comics precisely because they were an important part of many girls’ school lives. Of course they also made up a big part of other popular fiction read by girls; it becomes a reinforcing theme that is always available for use. This is probably one of the most pervasive themes you could possibly have in a girls’ comic; no doubt those who are expert in other comics titles will be able to mention many more examples of stories and of unusual sports featured in them. Reviewing the list above, I am surprised not so much by the number of stories as of the range of sports included. 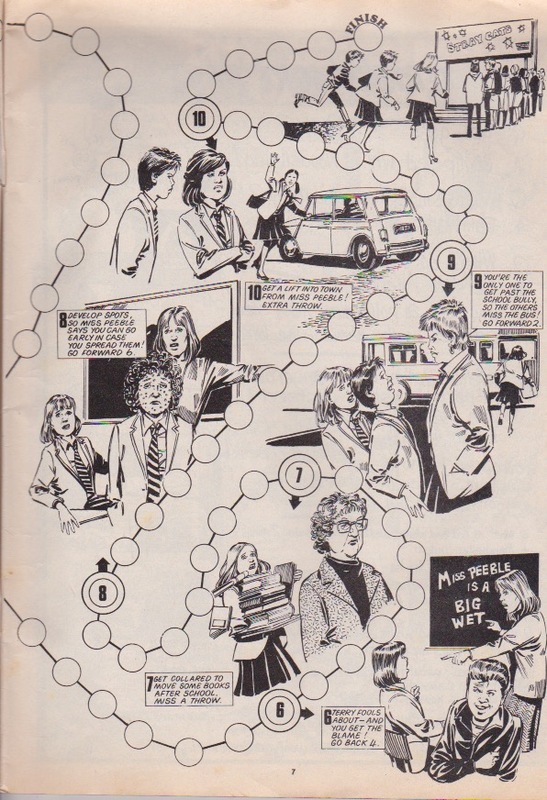 Of course the sports that girls played on a regular basis at school – hockey, swimming, athletics, netball, running – would feature in the girls’ comics. Even then, the weighting of specific sports doesn’t seem entirely even, mind you – in Jinty there was only one netball story compared to two or three hockey stories, and a few athletics stories. 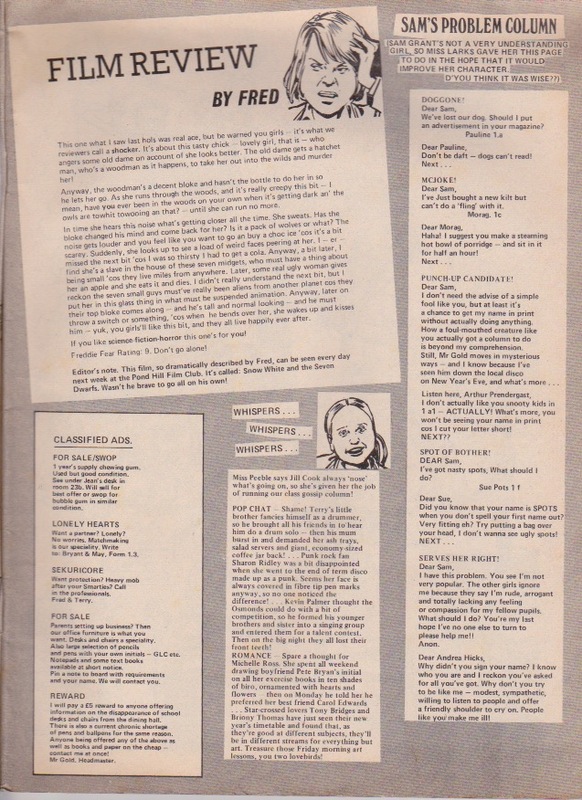 There is a noticeable absence of lacrosse stories despite the fact they are a staple of girls school prose fiction (I am sure they must be included in some other comics titles). I also don’t recall any rounders stories, which was a very typical summer sport for girls to play. I am sure that other titles included some aspirational sports such as figure-skating or show-jumping as Jinty did, and the inclusion of some ordinary if less usual sports such as orienteering doesn’t seem unlikely either. 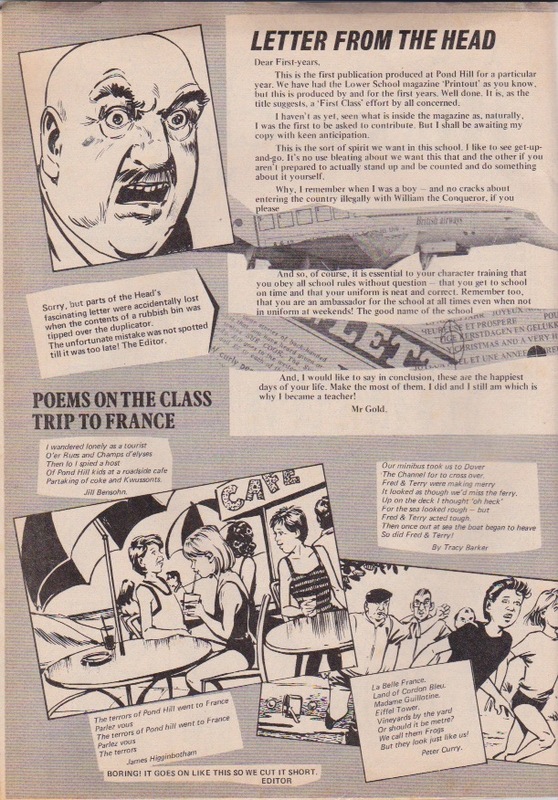 However, the fact that skate-boarding, table-tennis, and judo were included as part of the range of stories shows, I think, that Jinty wanted to push the boat out and include elements that were not just a bit unusual, but also modern, fresh, and popular in the wider world: elements that were not marked as ‘élite’ and expensive. The Jinty holiday special for 1981 has one very unusual Pond Hill feature – the First Class Mag. This is a magazine that the First Years of Pond Hill have produced by themselves, for themselves. It is different from the regular Pond Hill newspaper, The Pond Hill Printout. 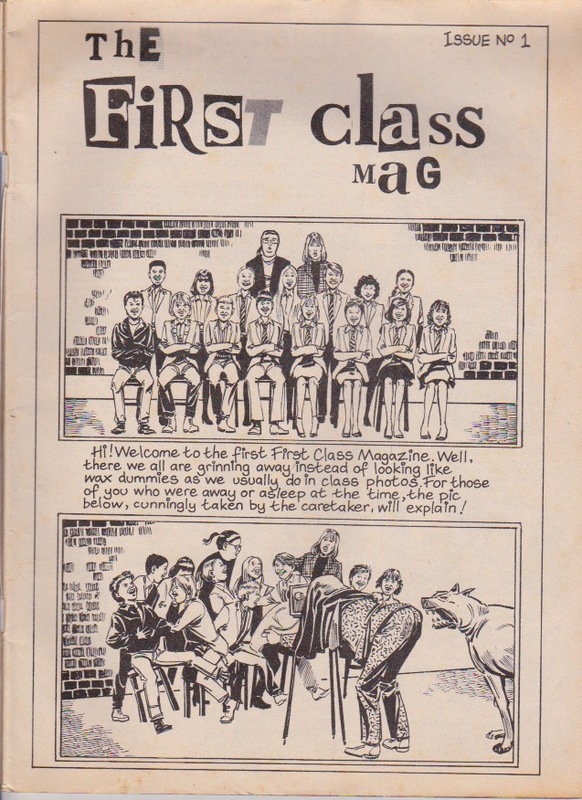 The First Class Mag is reproduced below. We get some insights into Pond Hill that we don’t normally find in the regular strip! It also makes references to the 1980 trip to France, which they almost missed out on because of Diana’s jealous sister holding them up. And it looks like Fred and Terry will never hear the end of their getting sick on the ferry while it was crossing the Channel. At least there is no mention of their getting arrested by the gendarmes when they pick up a runaway boy who is thought to be kidnapped. The First Class Mag is definitely the highlight of the special. 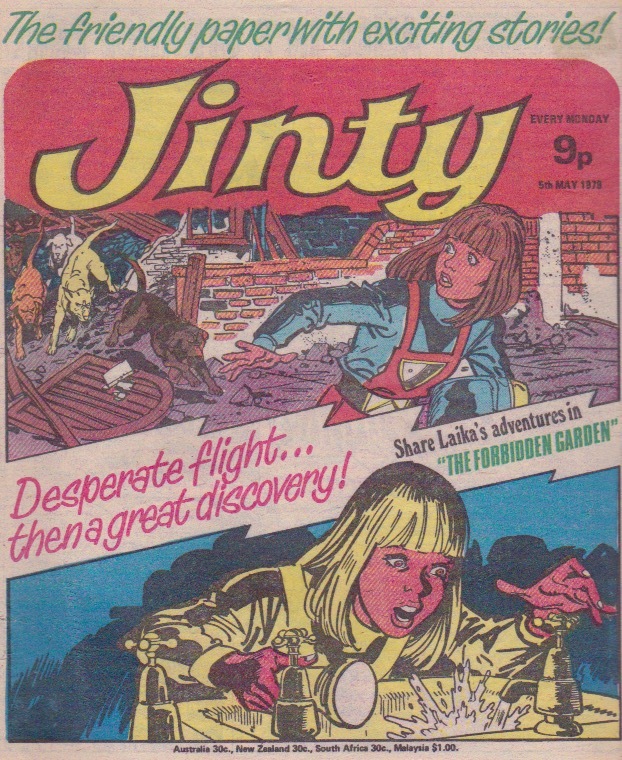 The holiday special also reprints “Nina Nimble Fingers”, one of the first stories from Lindy, a short-lived comic that merged with Jinty in 1975. Perhaps it is a bit disappointing that Jinty chose not to reprint one of her old strips instead. On the other hand, it is nice to recapture some of the short-lived and long-forgotten Lindy, and Nina can be considered one of her stronger stories. Nina Sinclair and her lame sister Clare work for Madam Estelle, the owner of a Victorian dress shop. Madam Estelle is a hard, greedy, slave-driving woman, but there is not much Nina can do because Madam Estelle is her legal guardian. As if that weren’t bad enough, the jealous Maria keeps playing tricks on Nina. But we know things will change during the course of the story. Gypsy Rose stories seem to be more reprints of old Strange Stories, substituting Gypsy Rose for the Storyteller. 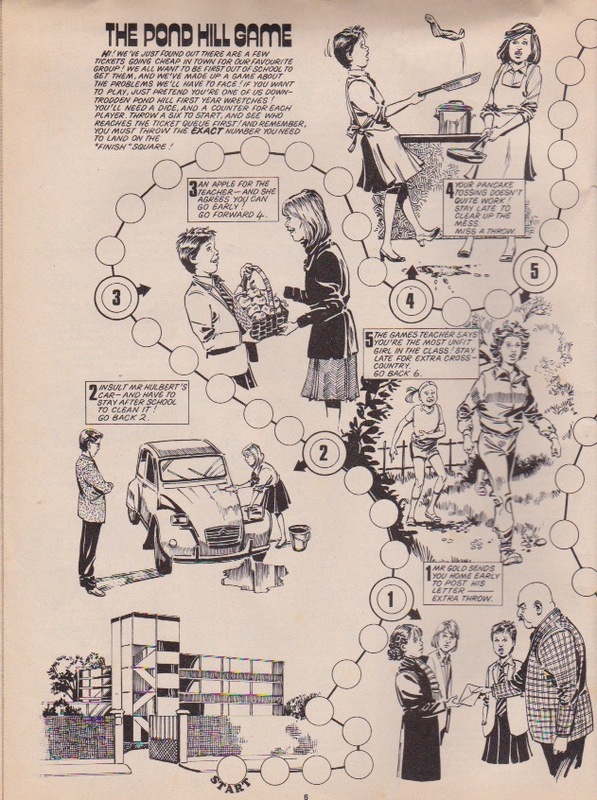 And this being a holiday special, the features focus on holidays, such as converting old beach towels into beach bags, and plenty of holiday-themed quizzes.